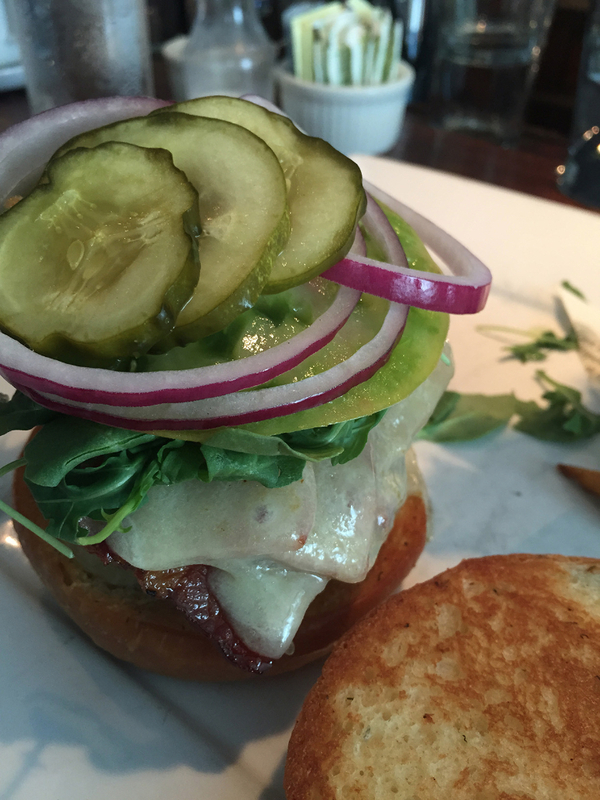 Already one of the top restaurants in the Lehigh Valley with one of the area’s best brunches, Bolete has been generating some buzz with its burger. 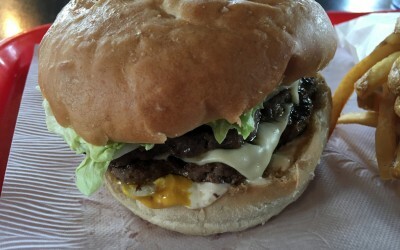 Recently landing on a few best-burger lists, including Thrillist’s Top 15 Burgers in Pennsylvania list, it was time to give this burger a try. If the above paragraph isn’t impressive enough, Bolete’s Chef, Lee Chizmar, is a well-deserving James Beard Award finalist for Best Chef in the Mid-Atlantic. Chef Chizmar, an Allentown native who co-owns Bolete with his wife Erin, honed his craft in Boston, and their big-city experience clearly shines through. It’s hard to find a place in the Lehigh Valley with such a detailed and articulate service. The staff is constantly on-point and incredibly knowledgeable. The restaurant noticeably runs like a well-oiled machine. And it has to run so smoothly, considering their tiny kitchen and a single 6-burner stovetop. What comes out of that tiny kitchen, however, is phenomenal. 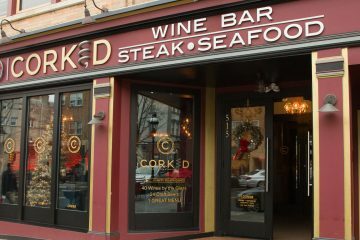 Furthermore, they also have a very ambitious, creative and notable cocktail program, which has only recently been matched by some of the newcomers to the Lehigh Valley restaurant scene (Mushroom Martini, anyone?). Prepare yourself, the words “perfect”, and “perfection” will be used extensively in the coming paragraphs. 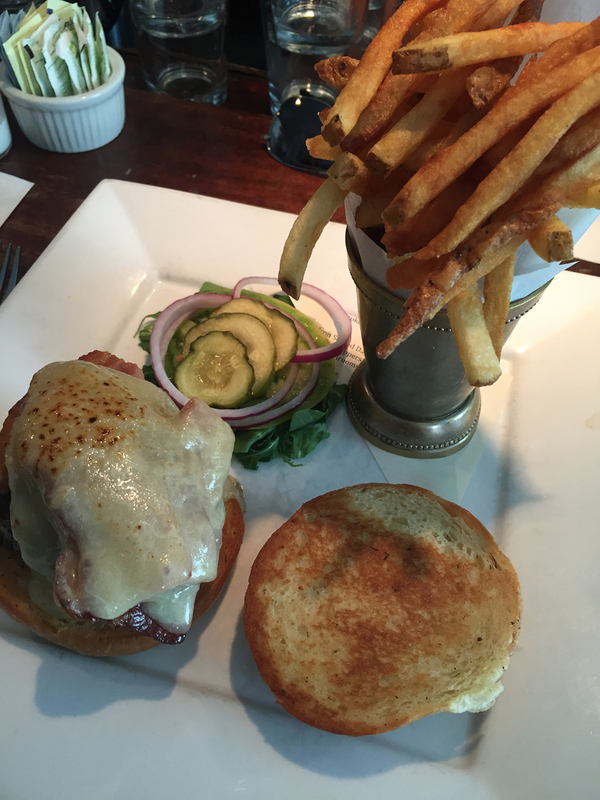 We visited Bolete on a Sunday, getting there just before 11am to beat the usual brunch rush. Sitting at the beautiful wooden tavern bar, we ordered some coffee and took in the calm prior to the start of the brunch craziness. Being set in a 200-year-old stone stagecoach building, Bolete’s overall experience doesn’t begin and end solely with their culinary offerings. You’re warmly greeted with a rustic farmhouse/tavern feel as soon as you walk in. Everything down to the pewter serveware, reclaimed wood surfaces and white table linens just drips quaintness. 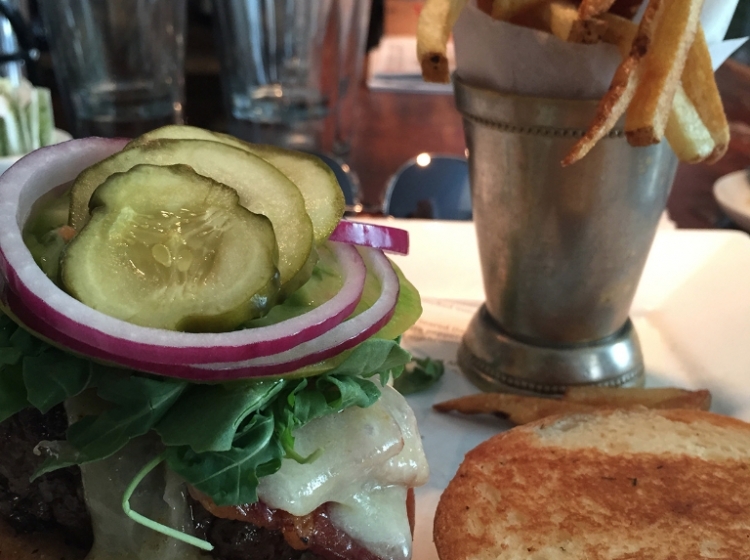 Of course, even though we visited during brunch, we’re here for the burger. 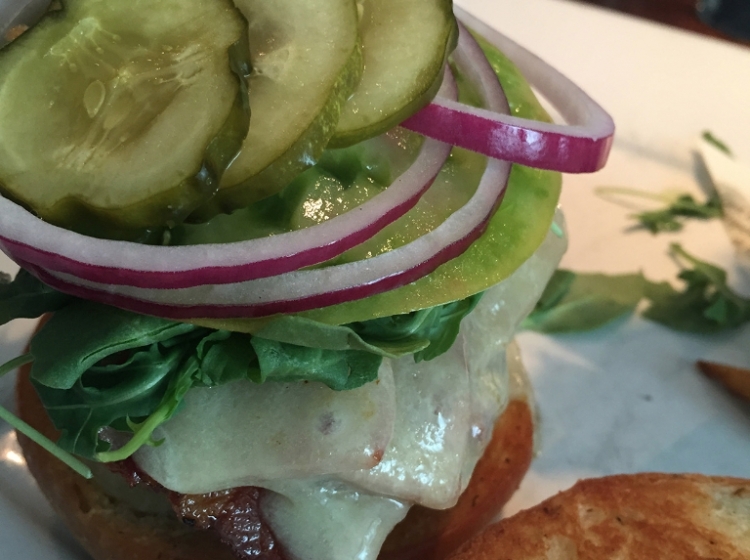 Billed as a “Cast Iron Seared House Beef Burger,” it has house cured bacon, red onion, Liberty Garden greens, and a choice of swiss, blue or cheddar cheese. You can even make it “Bolete Style” by adding mushroom marmalade for an extra $2. 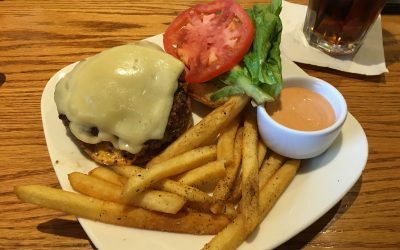 Being more of a burger purist, I opted to defer on the marmalade, and chose cheddar as my cheese (you can’t go wrong with any of the cheese options). It’s love at first sight. 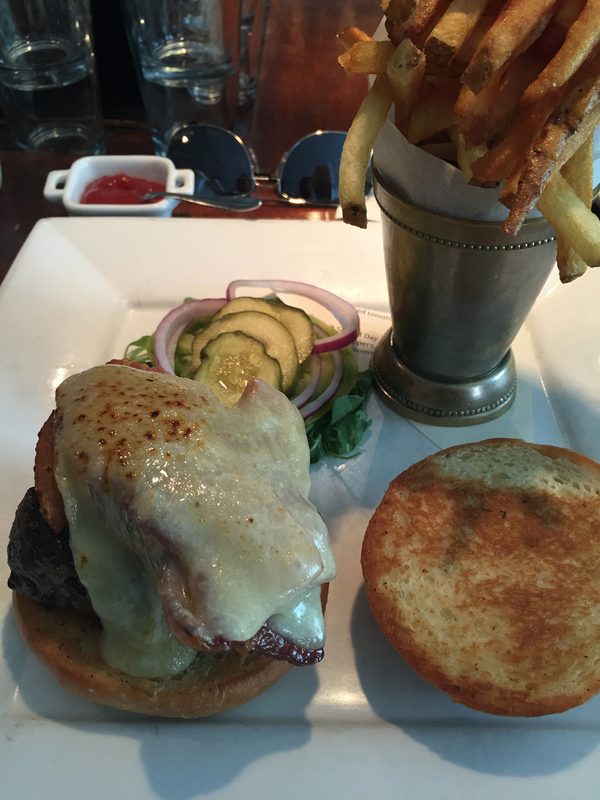 The presentation of this burger, just like everything at Bolete, is premeditated and purposeful, not just thrown on a plate and dropped in front of you. 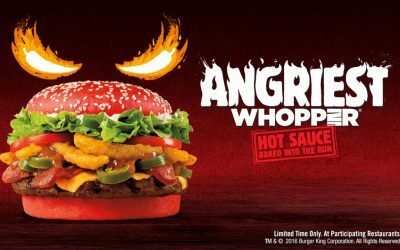 It’s not treated as a lowly burger. Rather, it’s given the same respect as they would pay to a featured fish course from the dinner menu. 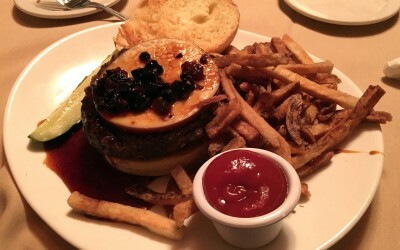 The upper bun and toppings come placed on the side, so the slightly browned cheese is the first thing you see. 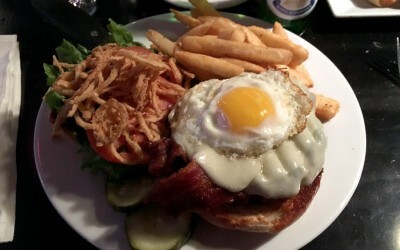 Then you notice the beautiful, meaty bacon underneath, nestled on top of a nice thick, juicy burger. I compose the burger and cut into it, to reveal a perfectly cooked patty. I mean, take another look at the pink in the middle. 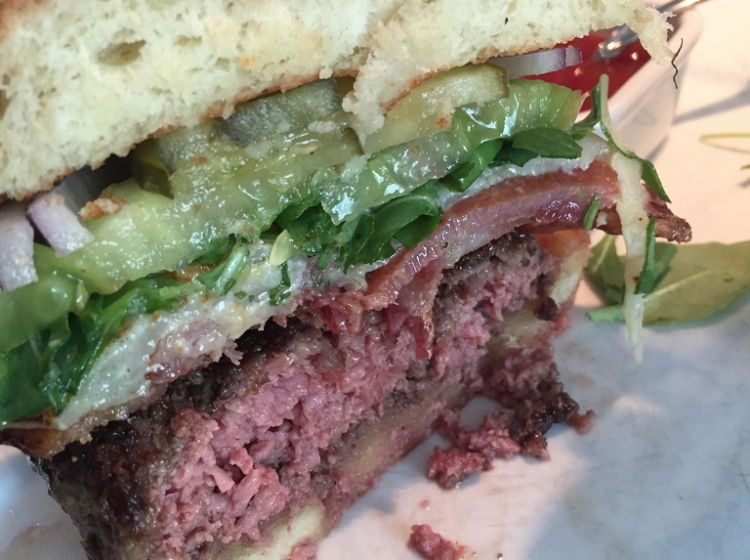 The patty itself is perfect in texture. Not too finely ground, and not too meaty. Smartly seasoned with plenty of salt and pepper, and as juicy as a burger can possibly be. The melted and charred cheddar cheese is noticeably sharp and slightly salty. This isn’t some cheap, basic cheddar. It has melted itself onto the thick slices of house cured bacon underneath, which themselves are well-seasoned and full of flavor. Not surprisingly, the bacon is also cooked perfectly, and isn’t flabby or fatty, but just on that verge of being extra crispy. Deep breath. 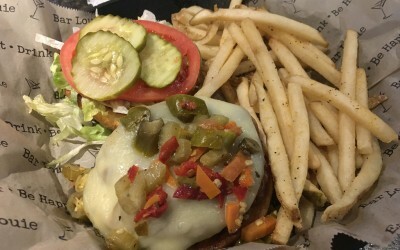 The fresh toppings are usually an afterthought in a burger review, but in this case, warrant details. Being that we visited Bolete in late August, the heirloom tomato was incredibly fresh, juicy, and meaty, which isn’t surprising, being sourced from one of the local farms with which they partner. 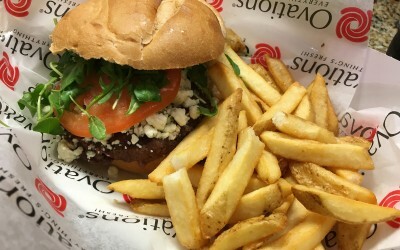 I’m a sucker for arugula on a burger, and the peppery bite was yet another welcome layer of flavor. But it may have been the house pickles that brought it all together. 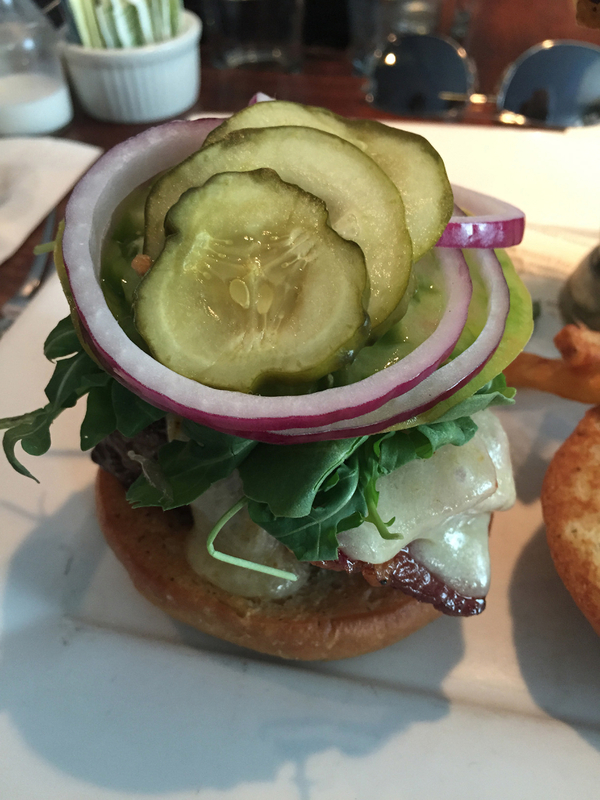 With every imaginable flavor profile firing in this burger: salty, peppery, gooey, savory… the tangy brininess of the pickles came through and wrapped it all together in a neat little bow. I’m smiling just thinking about it. 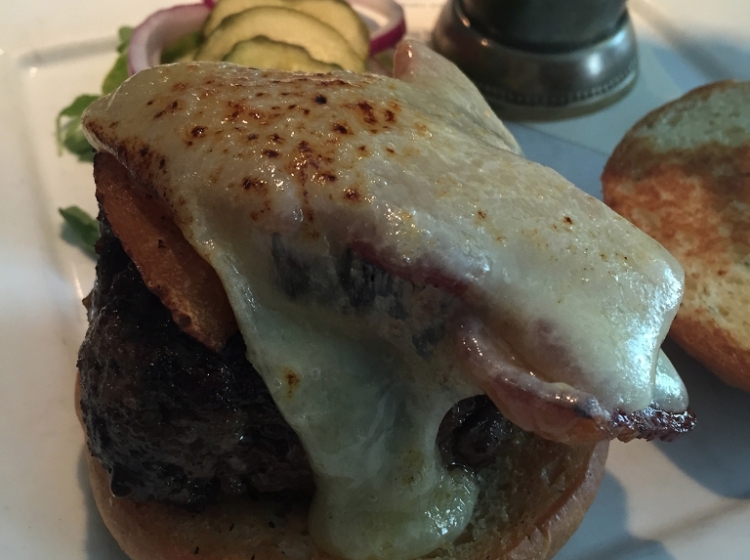 Now, taking into consideration the overall perfection that we’ve already established with this burger, here’s what sets Bolete’s burger aside: the amazing charred crust on the patty. There are plenty of people out there who swear that cooking a burger on a grill over an open flame is the only way to achieve burger perfection, but in my humble opinion, that’s not exactly true. The best way to cook a burger is in a heavy, hot cast iron skillet with lots of oil, butter, or other fat of your choice. 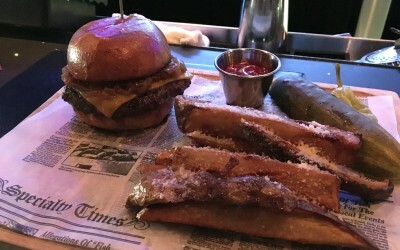 Cast iron pans – and carbon steel as well, if you want to be picky – are the only way to get that awesome, all-over crispy, crunchy char on a burger, and Bolete’s burger achieves that better than almost any restaurant burger I’ve had. It really is that good. Onto the bun, which is one of the best buns I’ve experienced. It’s is perfectly toasted and incredibly soft and buttery. 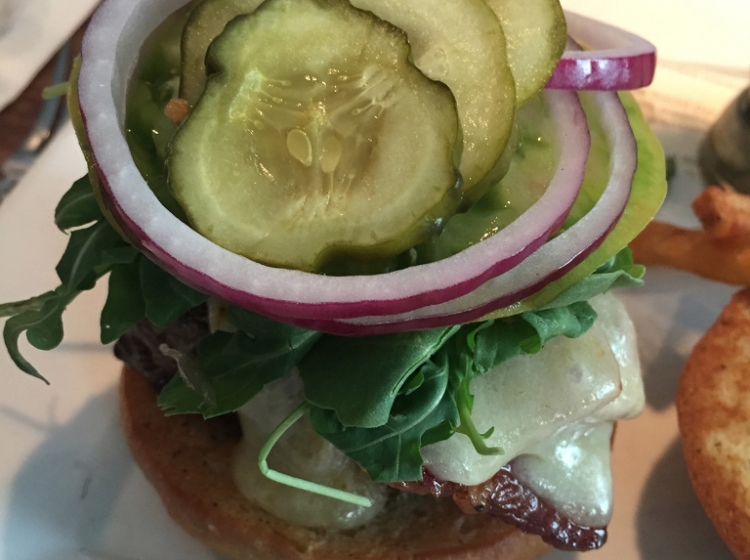 It’s isn’t just simply a vessel in which to get the burger into your mouth, this is another layer of complexity and flavor… an extra ingredient, not 2 pieces of bread holding your burger together. 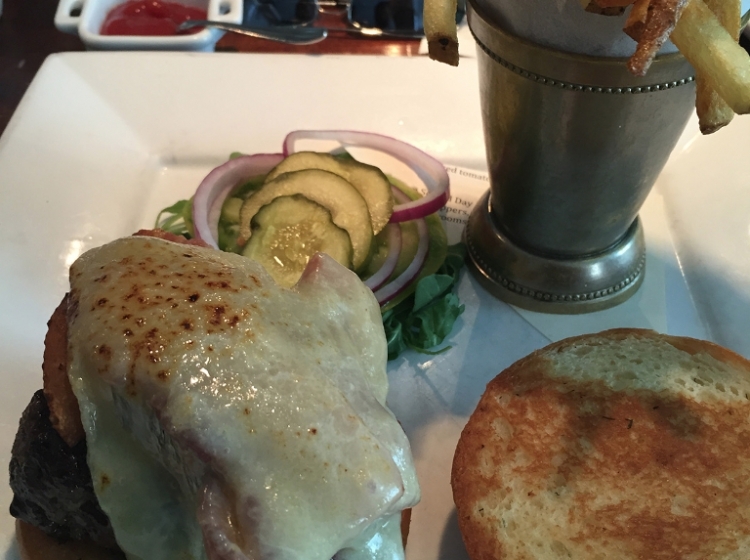 If served warm in a basket with butter, you could convince me the burger buns were specialty breads for the table. 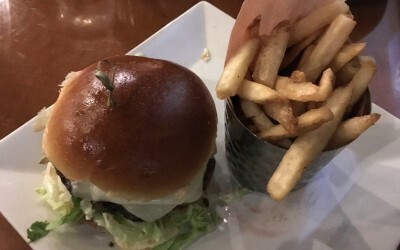 Take a look at the pictures of Bolete’s bun, then go browse pictures from other reviews. It’s pretty obvious, just from the photos, that this bun is far better than most. As for the fries? Well, they’d be my Lehigh Valley favorite if it weren’t for Curious Good’s fries. 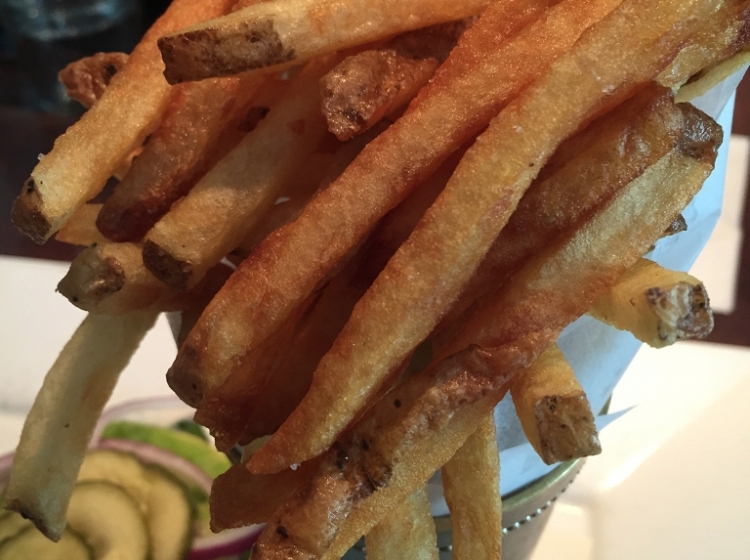 Bolete’s fries are among the best you’ll have anywhere, and accompany the burger in the most perfect way. Fried and salted perfectly with just the perfect amount of crisp-to-soft ratio. 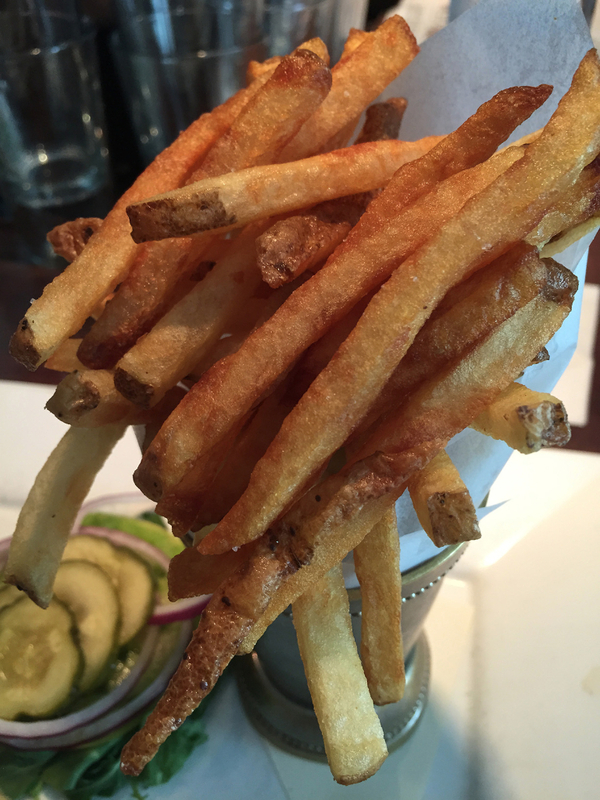 Although the fries are technically an add-on, you’d even love the house made chips that come with the burger. Made from razor-thin slices of fingerling potatoes, you’ll be questioning how it’s possible to cut and fry them so thinly without them falling apart. They’re incredibly light and crispy, and they practically melt in your mouth. On second thought, maybe you should just play it safe and order the chips AND fries. 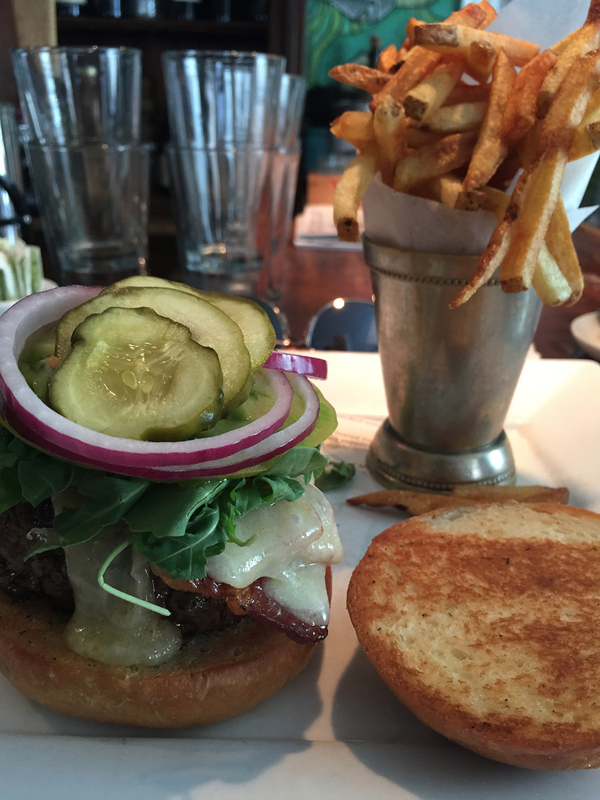 Final thoughts: Bolete’s burger certainly lives up to the hype. 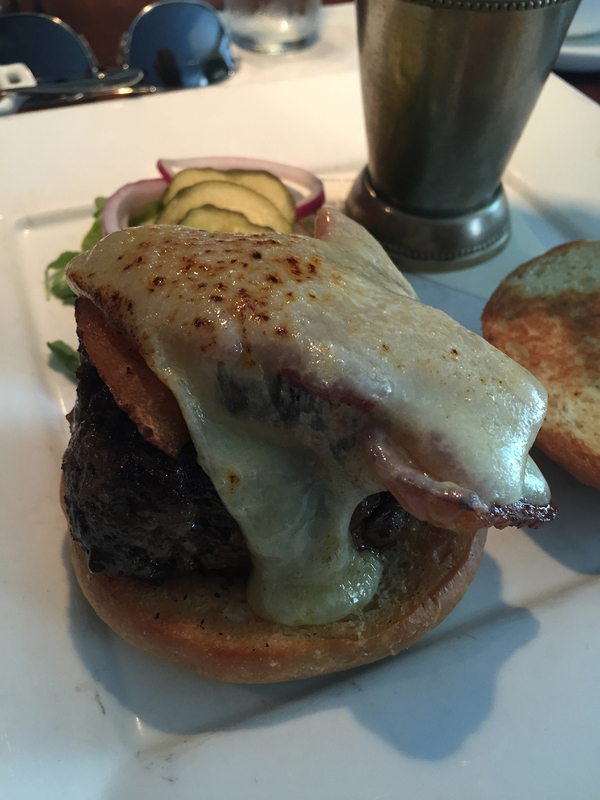 There’s not much Bolete could do to improve upon this burger, and comes very close to perfection. 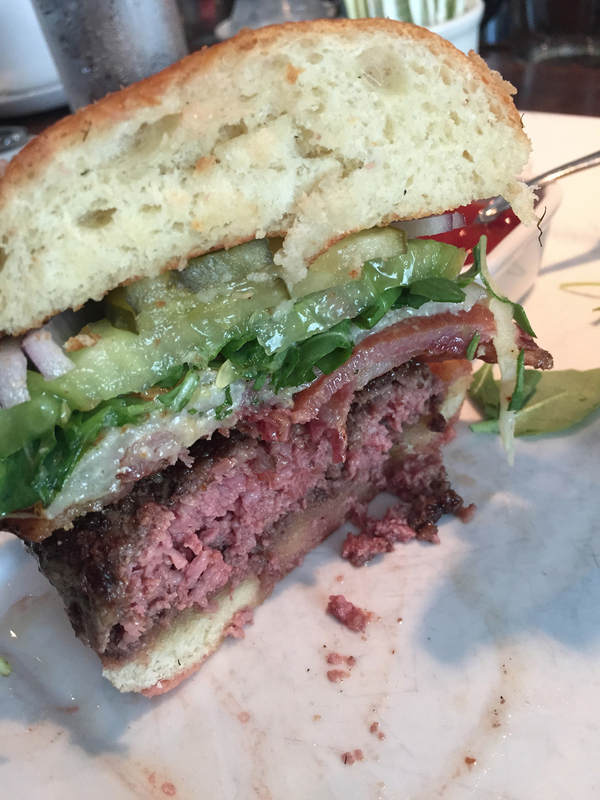 Perhaps a more “luxurious” burger blend or dry aged beef would make it a perfect 30… but at that point we’re just splitting hairs and taking this review to an unnecessarily pretentious level. Next time, perhaps I’ll try it with the bleu cheese and mushroom marmalade for a slightly different variation. 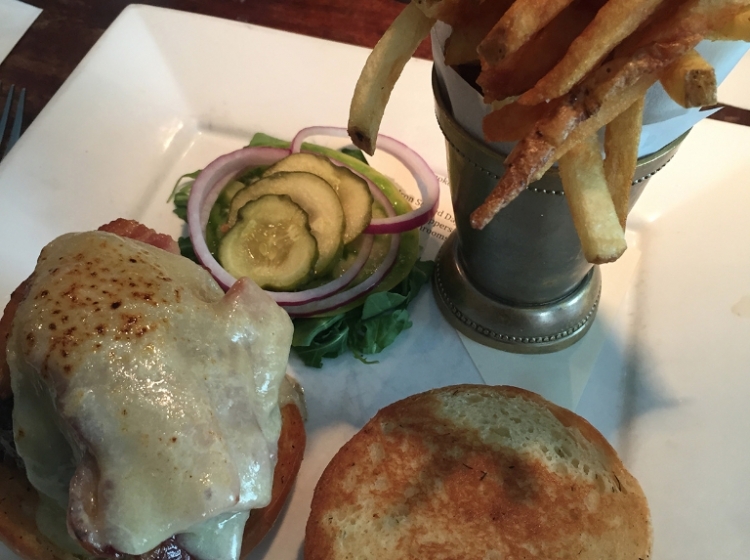 While $18 is likely the most you’ll spend for a burger in the Lehigh Valley, it’s beyond worth its price tag. Bolete is unlike any other restaurant you’ll find in the Valley. They go above and beyond, and the quality shows throughout the entire experience. 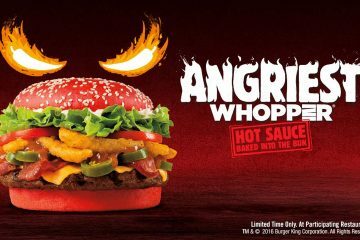 Go get this burger now. 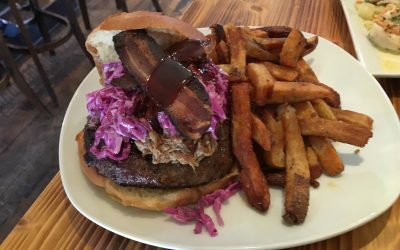 It’s not just one of the best burgers in the Lehigh Valley, but easily one of the best burgers within a 100-mile radius. Just don’t forget to make reservations, or arrive early.